WASHINGTON – Today, President Barack Obama named sixteen recipients of the Presidential Medal of Freedom. 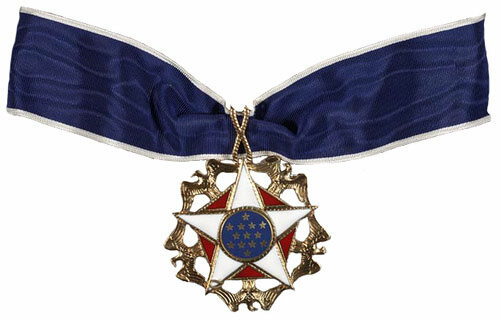 The Presidential Medal of Freedom is the Nation’s highest civilian honor, presented to individuals who have made especially meritorious contributions to the security or national interests of the United States, to world peace, or to cultural or other significant public or private endeavors. The awards will be presented at the White House later this year. This year marks the 50th Anniversary of the Executive Order signed by President John F. Kennedy establishing the Presidential Medal of Freedom, as well as the first ceremony bestowing the honor on an inaugural class of 31 recipients. Since that time, more than 500 exceptional individuals from all corners of society have been awarded the Presidential Medal of Freedom. Ben Bradlee is one of the most respected newsmen of his generation. During his tenure as executive editor ofThe Washington Post, Mr. Bradlee oversaw coverage of the Watergate scandal, successfully challenged the Federal Government over the right to publish the Pentagon Papers, and guided the newspaper through some of its most challenging moments. He also served in the Navy during World War II.